Ok, as we are all waiting for episodes 11 and 12. Here’s a list of all clues to who the baby daddy is from the 2012 reunion scenes. All these clues have be broken down and analyzed by tons of fans. But I haven’t seen it gathered on one comprehensive page yet. So here is my list. The race is close but Yoon-jae is winning!! that’s it. i’m catching up on all 10 episodes by tomorrow night. Oh, some one already wrote my argument! Totally agree with you. It doesn’t make sense to call him Jagi-ya” and the oppa. For some reason – even though he mentioned your looking fatter or getting fatter. It sounded like a statement or a dig lol Look at Shiwon & Yoonjae role model – her parents – that is something they would totally do. Dont give up hope… I think we will prevail at the end. I feel it. She’s pregnant. So, of course he’s going to joke with her and say she’s gaining weight, b/c pregnant women gain weight. Her BFF said the same thing. Close and friends and family would joke in that manner. The daddy picks up the picture with his left hand, right before that it shows Taewoong on the phone with his left hand preoccupied. Also the distance between Yoojung and Taewoong is too great for her to easily put the sonogram down in front of him. Definitely YoonJae for me..all the hints (at least from my view) were given at ep 11-last scene from yr 2012..when ShiWon forgot her ring..JoonHee noticed that ShiWon wears thecouple ring more than her wedding ring…TaeWoong mentions coz it holds a special meaning for her (coz when YJ gave it to her-it’s when she realized what she truly feels for YJ..with that confession-who wouldn’t)… and YoonJae says he’s surprised she didn’t lose it earlier (remember YJ telling her to throw it away but she kept it obviously ..yey! )..these words all hold a special meaning behind it…she wears the couple ring more than the wedding ring becoz this ring always remind her of YJ’s love for her..from the first moment that YJ was shown (with SW VoiceOver introducing the guys coming in from the funeral)..was it only me noticing her very melting gaze over YJ-her eyes shouting…awww-there’s my sweet living husband…kekkee…but that’s just me swooning over these cuties..
Definitely YoonJae for me..all the hints (at least from my view) were given at ep 11-last scene from yr 2012..when ShiWon forgot her ring..JoonHee noticed that ShiWon wears thecouple ring more than her wedding ring…TaeWoong mentions coz it holds a special meaning for her (coz when YJ gave it to her-it’s when she realized what she truly feels for YJ..with that confession-who wouldn’t)… and YoonJae says he’s surprised she didn’t lose it earlier (remember YJ telling her to throw it away but she kept it obviously ..yey! )..these words all hold a special meaning behind it…she wears the couple ring more than the wedding ring becoz this ring always remind her of YJ’s love for her..from the first moment that YJ was shown (with SW VoiceOver introducing the guys coming in from the funeral)..was it only me noticing her very melting gaze over YJ-her eyes shouting…awww-there’s my sweet loving husband…kekkee…but that’s just me swooning over these cuties.. I am so going to marathon this later and see if I pick up more of the heart warming clues =). Can I join the game? Latest clue (ep11), Sungjae said Siwon prefer her couple ring instead of her wedding ring since “…she likes something comfortable. So does her husband” It is Yoonjae for sure. Comfortable = BFF right. 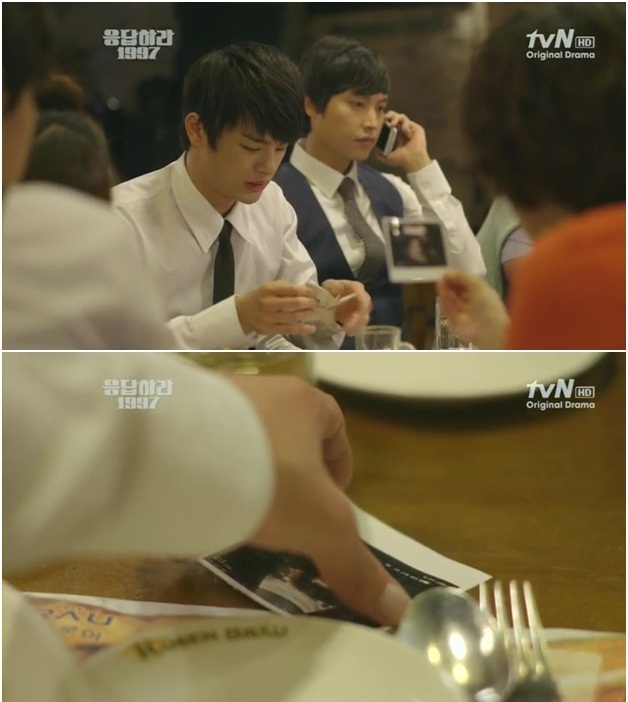 Joonhee said YJ & SW are so comfortable to each other so that first he thought they were twin. all of my hair off.. but i thinn its Yoon jae hes the main character(as well as shi won) anyway. my hair is nearly all gone already, thanks to the OTP. i’d like to save the last few strands, please. ^^ hehehehehee!! This is killing me! I can’t wait until next week! If Yoon Jae and Shi Won doesn’t end together. Imma stop watching Korean sitecom..
(T.T) I just saw the title of the last episode.. “The reason why first loves don’t last” does this mean it’s gonna be Tae woong? OMG I cant wait two more weeks.. I really can’t..